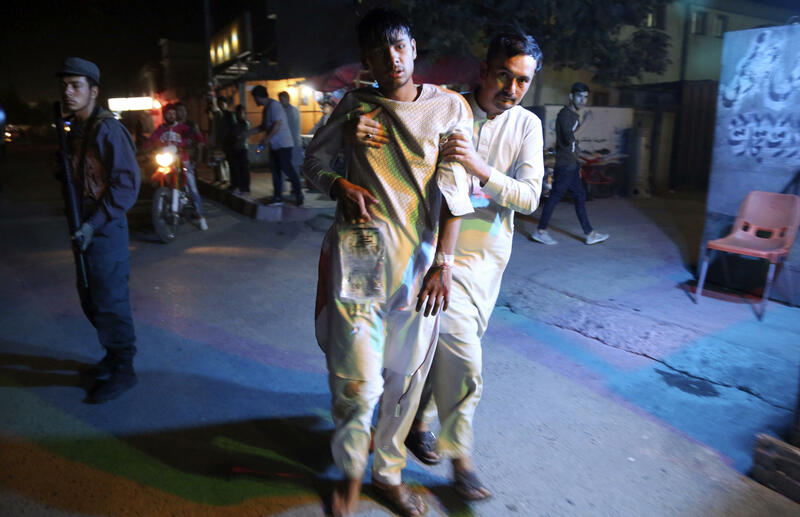 KABUL, Afghanistan -- Twin bombings at a wrestling training center in a Shiite neighborhood of Afghanistan's capital on Wednesday killed at least 20 people, including two reporters, and wounded 70, Afghan officials said. Interior Ministry spokesman Najib Danish said a suicide bomber struck at the center and then a car bomb went off nearby. Sediqullah Tawhidi, a senior member of the Afghan journalists federation, said a reporter and a cameraman working for Tolo TV were among those killed, and that another local TV reporter was wounded. No one immediately claimed the attacks, but they bore the hallmarks of the country's affiliate of the Islamic State of Iraq and Syria, or ISIS, which has carried out a wave of deadly bombings against minority Shiites. The Sunni extremists of ISIS view Shiites as apostates deserving of death. ISIS last struck in the area, Dasht-e-Barchi, in December, with three back-to-back explosions that left more than 40 people dead. Gen. Daud Amin, the Kabul police chief, said at least seven police were among those wounded in the car bomb explosion. Elsewhere in Afghanistan, a roadside bomb killed a district police chief and another policeman in the northern Badghis province, according to Jamshid Shahabi, spokesman for the provincial governor. The latest violence in the Afghan capital comes about a week after a U.S. strike killed a senior ISIS commander in eastern Afghanistan, Afghan and U.S. officials said. The strike in Nangarhar province killed Abu Sayeed Orakzai, a senior leader in the extremist group, according to Shah Hussain Martazawi, deputy spokesman for the Afghan presidency. He said the operation showed the government's "determination to fight terrorism." The ISIS affiliate that emerged in Afghanistan in 2014 has carried out scores of attacks targeting security forces and the country's Shiite minority. Even with U.S. and NATO support, Afghan security forces have struggled to combat ISIS and the more well-established Taliban.